I don’t think we have ever just sat about and done absolutely nothing on a holiday but today has been one of those days. Bev has read a book and ventured into the sea and CJ has been to the bar for a mixed fruit punch and eaten little sweets brought round by the staff. We saw a thunderstorm out at sea as we ate our Pad Thai tonight which made it at least 1 degree cooler. That’s about it really and as it’s our last day in Paradise, this might be our last blog entry for this holiday. We are up very early tomorrow for our flights; that’s if we decide to come home at all. Thank you for all your comments, it’s been great to keep in touch. See you back in the UK, where it’s no doubt warmed up considerably in time for our return home. We made the most of not having to be up early and meandered to breakfast after 9. It was already very warm and the place was a hive of activity, with staff watering the lush verdant plants, carrying out housekeeping duties and the ubiquitous sweeping. Thai people appear to do a great deal of sweeping and at any point during the day, though early morning does seem to be a particular favourite before it gets too hot. We have never had breakfast on the beach before but would recommend it if you are lucky enough to have it somewhere as idyllic as Khao Lak. Another thing that makes this such a special place is the staff. They are all so lovely. Bev said hello to a gardener busy watering and next thing he pulled off some fruits from a tree and gave them to her, eating one himself to show it was OK. Talking of fruit, we had melt in the mouth mango today. The main season is March to May, but maybe they are earlier because Summer’s come early. We are addicted to pineapple – it’s so sweet and soft here. Mum (Bev’s Mum) would be in her element. Anyway we eventually dragged ourselves away from the beach and prepared to go into town. There is no town in some ways, just lines of shops spread out along the length of the shoreline, but whatever you call it, there are plenty of things to buy. As it was hot when we set out, we elected to go by tuk tuk. We spent a hot hour shopping to help Chris achieve his beach bum look and Bev to add to her collection of World’s lightest weight clothing. Locals tell us how hot it is and how hot they are, but when you point out that they are wearing jeans and jumpers and maybe shorts and a t-shirt might be better, they seem quite surprised. We’ve had a lovely lazy afternoon today, walking on the perfect beach, lounging on a lounger, reading and listening to music and staggering back to our room to cool down and snooze. Both of us thought that we would be thoroughly bored by a beach holiday, but after a very hectic few weeks, it’s lovely to just chill, (as the kids say). We cannot fault the Paradise Resort, its staff are lovely, its food is amazing, its setting is second to none, and amazingly there are absolutely no creepy crawlies, mozzies or flies to contend with. We think that there are fewer flying insects here, in the rain forest, than at home! We’ve just finished a huge supper and are now too fat for bed. Hope you enjoy the pictures, we have put them in the third album on the blog. We enjoyed a leisurely morning as we didn’t have to leave for the airport until 11. Moh was the perfect guide to the end and made sure we checked in painlessly before he Wai’ed and departed. We had one of those rare flights that left and arrived early. Yet again the in-flight food was a mystery and was much the same for the meat eaters. A cardboard lunchbox containing a bit of salad, water, juice and fruit – nothing more substantial or nutritious. Landing at Phuket was an experience. The runway is obviously very short and the captain applied very heavy braking immediately on landing which was rather disconcerting. Not as disconcerting as Phuket terminal however, which was heaving with loads of people all scrabbling for a taxi in the heat. UK security people would have a field day as inbound and outbound passengers pass each other in the corridor. We found our way through the masses to the exit and were hit by a wave of heat. We were glad to meet our guide quickly and get into an air conditioned car and to leave the madness of Phuket. The countryside is quite different here. There are thousands of rubber trees in amongst tall, lush tropical forests and huge palm trees everywhere. The dialect is also different; just when you have mastered the right way of saying hello in Thai, we are now looked at blankly as they have a different way of saying it here. We didn’t take to the guide and are pleased he’ll only be back to take us to the airport on Thursday. He is a little too trendy for us and wasn’t as friendly as our other guides. We thought that it was quite amusing that he fell asleep on the way to our hotel. I would have thought that one of the prerequisites of a guide is that they stay awake! Khao Lak is about an hour north of Phuket. It was devastated in the 2004 tsunami and has since been totally rebuilt. Paradise Resort is a collection of stand alone chalets, right on the beach which is beautiful, wide and sandy. The beach front is lined with bars and restaurants all done in a very tasteful and traditional manner. There is no tackiness about this place, but it is quite a bit more expensive to eat and drink than Chiang Mai, presumably because we are captives here. We are also quite surprised by the temperatures. We were expecting it to be cooler by the sea but it must be in the high 30’s by midday here. We have also been amazed at the volume of the cicadas; they are deafening when they get going. Neither of us has experienced anything quite so loud in insect form. We took a leisurely stroll along the sand this evening when the sun was just setting, it were right romantic Gladys. CJ even ventured into the surf up to his knees which is extreme for him. We ate at the resort tonight, right on the beach, looking out to sea, watching the lights of distant fishing boats bobbing about on the horizon and thought about the UK and the cold. We plan to venture out tomorrow to Khao Lak centre, for CJ to purchase some surfers’ shorts and for Bev to get a spray tan! Don’t be surprised if we come back as a pair of beach bums. May I just take this opportunity to explain to anyone not familiar with Fifi that he was a fluffy toy when I was little and is not a current companion! Being in the junior suite obviously suits us as we both slept well and woke up raring to go to see elephants. Moh came to collect us at 8 and we drove for about an hour to the elephant camp. We saw about 12 elephants, all beautiful and getting ready to go and do various tasks. We started our day with a ride on an elephant. It turned out that we were on the lead elephant so our mahout had the task of setting the pace. He worked very hard giving gentle and constant kicks to the base of the ele’s ears. Most of the time that was quite successful, but every now and then the elephant decided to stop either to rest or have something to eat. The rest of the caravan also had to pause while our mahout made encouraging noises to try to persuade the ele to move. Chris joined in with his tried and tested elephant commands, and between them they managed to get the elephant back on the move – until the next time she decided to stop. For those of you who haven’t been on an elephant, it’s quite a rolling sensation and you have to sit so the weight is evenly balanced to help the ele move as easily as possible. We were a bit worried that we would be a burden, but I think she didn’t mind as long as she got to stop and eat when she felt like it. Our route took us through lovely wooded jungle and also into the water. It was a lovely experience and we had a wonderful time. Next up was elephant bathing. It was great to see them having such a good time. The mahouts gave them a good soaking and scrubbed them with what seemed a very small brush for such a huge creature. Having had a treat, they were put to ‘work’ by showing the kind of tasks they can do, including pulling and lifting logs. There was also a show element as they picked up the mahouts’ hats and put them carefully on their heads and the 2 youngest painted a picture. They aren’t used for hauling logs anymore, so their main job these days is entertaining tourists, which they do with ease and charm. We have always loved elephants and today has only increased our affection for these intelligent, wonderful creatures. We then walked for about 25 minutes through the jungle to visit a Lisu hill tribe village. Moh did his usual excellent job of teaching us about what kind of trees we were seeing, which of the fruits and nuts were good to eat and so on. We have been struggling with seeing fallen leaves in temperatures of 30 plus. For us, today’s walk was like a UK Autumn trudge through fallen leaves but in hot Summer temperatures. The Lisu tribe originate from Tibet and it is quite obvious when you see them in their beautiful colourful costumes. At the centre of the village are a number of stalls where the Lisu sell home made, woven and sewn items and we took a very short time to purchase a few things as they are quite irresistable. Chris had already bought Bev a really pretty lightweight scarf at a stall in the ele camp. Whilst the lady was putting the scarf in a bag, he picked up a little woven bracelet and remarked on how pretty it was. The lady popped the bracelet in the bag and said, ‘for free’. That set Bev off – these people have so little but are willing to give things away. We can’t wait for you to see our purchases on our return. We walked back to the ele camp where we boarded our bamboo raft for our gentle trip along the river. It was a lovely slow journey past resting elephants, finished with their daily tasks. Everything is so well planned. On arrival at the terminus of the raft we were met by yet more people trying to sell us things along with our driver. We headed off for lunch at an orchid farm after which we toured the farm admiring the beautiful array of flowers. We also visited the butterfly farm and then headed back to our hotel. This evening we hit the Sunday market and Chris bought a belt for about 60p and Bev managed to buy 4 cotton blouses for the princely total of £14. The young woman running the stall was a real saleswoman and delightful to boot. She told us what we already know; that Chiang Mai is nicer than Bangkok. She also said we should come back next year. We finished the day back at the veggie restaurant we found on our first night here and had another good meal. See you at Khao Lak tomorrow. At first sight, Chiang Mai seems as mad as Bangkok with vehicles avoiding accidents by millimetres and people selling anything at any time of the day or night. However, on closer inspection, it’s a more appealing and attractive city. We are staying in a slightly odd hotel which got off to a bad start by putting us in the wrong grade of room. That was compounded by it being quite noisy so this morning we we prepared to tell our guide our woes. We have now been upgraded to a junior suite for our remaining 2 nights here. Let’s hope we can escape the noise. It was fairly late when we arrived yesterday and we decided to find somewhere local to eat. We wandered up the road with a hopeless map and unreadible street signs rand came across a veggie restaurant. The food was really cheap – about a pound a dish – and very tasty and as usual hosted by some lovely Thai people. All the customers were Europeans and there was a good sprinkling of ageing hippies. We met our new guide this morning and headed off in a local bus to an ancient city that the then king had chosen to be the capital. It remained so for only 10 years before the Ping River flooded it. We visited some ruins of temples and other significant buildings and then, slightly templed-out, headed back in our private taxi van to Chiang Mai proper to do a tour of some of its major temples. Moh, our guide, is a practising Buddhist and is extremely knowledgeable about its beliefs, history and rituals. We probably won’t be able to remember a fraction of what he told us but it was fascinating and interesting to compare Western beliefs and customs with Buddhist ones. There are a surprising number of similarities. We had a great lunch of curry noodles which was delicious. Moh ate by himself even though we asked him to join us. It’s not the done thing for guides to eat with guests apparently and is more respectful. We didn’t want to upset him by insisting. After lunch we visited several more temples, including one housing an 1850 year old Buddha. Amongst the many things we learned were that Buddhists have their own calendar which started in the year Buddha died. They are in year 2253 this year. Buddhism will apparently finish after 5000 years as that was what Buddha decreed. We were exhausted after all that information and temple visiting so it was back to the hotel for a rest before we brave the night bazaar. Just back from a fascinating walk along the night bazaar which seems to occupy most of Chiang Mai! Full of tiny stalls selling anything from Louise Vitton bags to carved frogs that croak when you stroke them, this huge open market starts up every night at six and finishes at two am. The place was busy with tourists haggling over the price of a fake Rolex or pair of silk pants; everyone was out but the mood is calm and unthreatening and there’s no hard selling or pressure. Rather embarrasingly, we ended up in a pizza restaurant tonight, we decided that it’s ok to not eat Thai every night and sometimes it’s good to give the UK stomach a rest from the chili! We are very excited as tomorrow it’s elephant riding and bamboo rafting in the jungle. Well it’s nice to be back in radio contact with you all again after two days on the dark side of the moon. We were quite sad to leave the tranquility of Lanjia Lodge as we knew that the next three days in Chiang Mai were going to be a mad affair. We were met by our guide, minibus and driver at 8:30 which is pretty early for us and set off westwards on what was to be a very long drive to our next stop. We have found that when you are not in total control of your holiday, you become a little bewildered and vacant and put a lot of trust in the people who are in control of your daily lives. So it was with Chuan, who told us a minimal amount of what we were going to be doing today and as it turned out, left out a fair bit of detail that might have been useful to know before it was too late to back out! Our first stop was in Chiang Rai where we and the guide left the driver and minibus to board a small, low, long tail boat on the Kok River which winds its way toward Chiang Mai. Just like the long tails in Bangkok, these simple boats dash over the surface of the water, powered by massive truck engines, connected by direct drive to a prop shaft and propeller which the boatmen can lift in and out of the water to steer the boat. Unfortunately, the river was unusually dry with lower than normal water levels. This made for an unexpectedly bumpy journey at times as we hit rocks just beneath the surface and came close to running aground on a sandbank. It was only the boatman’s skill that saved us from having to wade to land. We’d been issued with lifejackets at the outset but as we realised just how shallow the river was, we thought they were rather unnecessary. However, the journey was cut short as the further upstrem we got, the shallower became the water and we abandonded the river trip a little earlier than expected but not before pulling in for 15mins at an elephant stop! This was extremely exciting. There were at least 20 elephants, some waiting to be ridden, some already on their way and others wading in the river on their way back with people atop. There were elephant treats available in the form of bags of sugar cane and bananas and Bev was off like a girl pocessed eager to feed as many as she could in the short time that we had with them. They were a joy to see and they all looked pretty happy with life although a little bored, waiting for the next customer. We now can’t wait until we get an opportunity to ride our own hefalump. After getting back in our boat we ran aground a few times and the boatman decided to call it a day before we were completely stranded so we stopped for lunch in a very nice hotel which was full of Germans and continued by the minibus that had followed by road. Our next stop, after an hour or more’s drive was definately the oddest place we’ve been to so far. Described by our guide as a “caf”, we were not surprisingly expecting a place to eat, what he actually meant was a “cave” which turned out to be in amongst a collection of stalls and temples in the strangest place on earth. As per usual, we were not quite prepared for what was on offer and weren’t asked if we had any health or physical problem with what was just about to happen to us, it was just assumed that neither of us suffered from claustraphobia and so down the cave went. Bev and I have had lots of experience of cave visits, but none of them have matched this one. On arival at the cave entrance we were met by a small Thai lady pumping away on a primus lamp which was obviously going to be the only form of illumination. There is no way that anyone in the UK would allow what we had to go through to access the cave. Quite a bit of the visit came close to pot-holing and the only way through parts of the unlit cave was on all fours with the continous guidance from the little Thai lady of “moind ya heed”. Just like Wookie Hole, the main aim of the tour was to pick out the very spurious likeness between the rock formations and familiar objects like an elephants lung, or the lotus curtain! We did make it out in one piece and have posted pictures of what was being sold nearby – the descriptions of the curative properties of the plant bulbs on sale are priceless. Chiang Mai is our current home-more of which next time. We both slept really well last night and even got back to sleep after the cockerel decided that 4.30 should be the start of the day. After a very nice breakfast it was off trekking in the jungle. We got on bikes for the 1st part of the journey – downhill all the way luckily as even by 9.15 it was feeling warm. Then it was on foot into the jungle. We had our guide and his helper with us; the latter had a machete with which he cut bamboo walking poles and cleared a path and carried bottles of water, towels and banana muffins in a bamboo backpack. Some of the journey was quite steep and we needed to rest, but it got a bit more comfortable once we were in the cover of the trees. We ended up at a waterfall where more hardy souls than us swim in the pools beneath. We settled for toes in the water. It was wonderfully refreshing. We stayed there for quite some time just resting and eating the delicious, freshly baked banana muffins. Having finally summoned up the energy to move again, we headed back to the lodge through the jungle and past someone’s farmouse which was the very definition of ‘in the middle of nowhere’. We learned that the government are trying stop the hill tribes farming by slash and burn as it is very bad for the forest, but we saw a lot of this still going on. We had a little rest before lunch arrived. All the meals here are 3 courses. We keep asking for small portions but the cook doesn’t seem to listen. There’s always a clear soup to start followed by either a rice or noodle dish and fruit to finish. It’s beautifully presented and tasty too. It’s been hotter today (30d C) so we asked Ton, our guide, if we could have a ride back up the very steep hill to the lodge by truck when we do our village tour. As it turned out, the evening has cooled and we could have walked. Our trip to the Hmong tribal village started with a short video presentation under a small thatched roof where we learned a little about the incredibly complex social structure of the main hill tribe communities that live in northern Thailand. We live amongst the Hmong and Lahu who live happily together, very primatively. There are apparently many different types of Black Lahu and each type has its own style of dress. After our short video we walked down through what can only be described as a primative collection of wooden and bamboo huts with animals and children running everywhere; dust, mud, scraggy digs, chickens and washing all mixed together, no Internet but satellite tv! We headed into the windowless Shamen’s house to learn of thier native ways and were both taken aback by his living conditions which is typical of the tribespeople. It’s really difficult to not look with westerner’s eyes but the sight of a dirt floor and general griminess, filthy bed and over bearing whiffyness, couldn’t be ignored. We had about half an hour with Shamen and were told about their specific beliefs which are pretty mad and too complex to go into here. This was probably the most interesting day so far – the furthest we have been out of our comfort zone and given us a tiny insight into another aspect of life in Thailand. One thing is for sure, even though these friendly, smiley, welcoming people have very little, they all look much happier and healthy than us westerners. We feel very priviliged to have been here. It was a horribly early start today and at 6am in 30 degree temperatures we were in a car to Bangkok airport. We said a fond farewell to Pat who really took excellent care of us during our stay and went through check in in record time. After a bit of breakfast, we made our way to the gate and enjoyed a short trip to Chiang Rai. We met up with our new guide easily and were soon on our way to Lanjia Lodge. It took about 90 minutes by bumpy road to get to the lodge and we were struck by the difference in temperature and humidity at once. It’s much more like a uk summer day than Bangkok’s weather. Chiang Rai is important for farming and we saw lots of paddy fields that had been harvested, being harvested and waiting for the next crop. We also saw water buffalo and teams of people in coolie hats wading about in the paddy fields. Lanjia lodge is a simple and beautiful Eco-friendly project designed to help hill tribes maintain a sustainable living and protect their way of life. There are 4 houses, each with 4 private rooms. We are the only people in our house which means we are getting a very personal service from some lovely local people who work in the lodge. After a really nice noodle and soup lunch we had a short nap and then got ready for our next guide to take us to a local house to try our hands at batik. We have met up with another couple who are staying here and together made a stab at a few batik pieces which are going to be died and dried for us to collect tomorrow. As Bev quite rightly pointed out, if the village were relying on our poor efforts to survive, they would be in real trouble! Please see photos of our efforts and the amazingly beautiful and intricately worked clothes that the hill tribe women wear. The lady and young girl were really lovely and persuaded us all to buy some their incredible work. Next on our busy schedule was to plant trees in a local plantation which is another royal sponsored conservation project to try and keep the hill tribes prosperous. It’s a really great idea as it’s more than just sticking a tree in the ground. We all got to paint a name plate and stand it with our chosen tree. Luckily we were spared the task of digging the holes in the rock hard soil in the blazing sunshine. We are now back at the very peaceful lodge, waiting for supper and some traditional hill tribe dancing. We hope there isn’t too much audience participation! No participation required which was just as well as they played instruments whilst they danced in most cases and we wouldn’t have stood a chance of keeping up with them. Their instruments sounded ancient and we later learned that the long bamboo pipes that they are made from are specially imported from China. A very special treat. The tribesfolk appear to speak little English and our Hmong is non-existent so we get by with smiles and “Wais”. There is a young man and woman looking after us and they are remarkably attentive. It’s like having 5 star service. It’s much cooler here so we are hoping to have a good night’s sleep tonight. Chris slept much better last night but Bev was quite restless. We had another very nice breakfast which included fruit to start. We think we had dragon fruit along with pomelo and pineapple. Pat came for us at 9 and we went by car to the river where we got on a long tail boat and went on a trip along the klong. The river is very busy and our boat driver did well to steer us safely through. The klong is amazing – loads of tiny homes interspersed with a few large Western style buildings. The klong is overrun by water hyacinths. We told Pat that 1 plant costs £2 in the UK. She was suitably shocked. It was a lovely journey and a great way to keep cool. We were stopped en route by a little old lady in a small boat selling wares and later stopped for fresh coconut juice at a tiny shop selling everything. Next was a car ride to Jim Thompson’s house. He was an American who put Thai silk on the map. He moved 6 houses to Bangkok and made a beautiful residence. It’s a traditional Thai house made of teak. He disappeared one day and has never been heard of again. We were tempted by several things in the shop – such beautiful silk goods but neither of us had a credit card so we haven’t been able to add to Thailand’s economy today, apart from stamps and electrolyte sachets. We have a very early start tomorrow and are then in the jungle for 2 nights so this will be the last blog for a couple of days. We’ll catch up with news once we get to Chiang Mai if we can get Internet access. There are more photos from our outings today for your viewing pleasure. This morning began with a very nice breakfast after an average night’s sleep. We are both jet lagged and quite tired but are ready for the day having packed light for the heat. We met Pat in reception and headed out close behind her like two ten year olds on a school trip. You have to keep close as she knows the terrain and has no fear of cars and trucks like us. You have to imagine that there are no real pavements to speak of, you have to negotiate huge changes in level, people selling pretty much anything and scooter riders who seem to think that the pavement is there for them. Off into Bangkok on the Sky Train which was wonderfully cool and then a short walk to a large taxi boat which sped along the Chapo Praya river which divides Bangkok into two parts. The walk to the reclining Buddha really did for Chris who was not ready for the 35+ temperatures and was quite unwell which we think was a combination of intense heat, high humidity and tiredness from lack of sleep. At the Grand Palace, Pat luckily got help for Chris from the Royal Hospital where he managed to see a very nice doctor. Pat was quite pleased as she learned a new word as a consequence – electrolyte. After Chris had recovered, we had a look around the Grand Palace which is quite spectacular. A cool yet scary taxi ride back to the hotel and a late lunch and we are now trying to summon up the energy to head out again. We are being treated, as we are most evenings to piped musac and the slightly odd Thai-Flamenco version of “wings beneath my feet” as people loll about by the pool. Our next door neighbours are in Bangkok at the moment as part of their 6 week holiday and we were meant to meet up but didn’t hear from them today so we braved the Sky Train this evening and found something to eat in an enormous shopping mall. We then visited a shop and CJ bought a lightweight shirt – he excels in air conditioned environments. We didn’t get much sleep on the flight despite cj having the luxury of more leg room by sitting by an exit. More strange airlines food-they need Jen to sort them out about veggie diets. We didn’t think much to thai airways – they don’t live up to the land of smiles that the thai people are famed for. We met our guide easily at the airport, which, incidentally is huge and very nice to move around. The guide’s name is Pat and she escorted us, along with a driver, to Ariaysom Villa. She told us bits about Bangkok en route to the hotel and said that summer has come early this year as it’s hotter than usual. We don’t have anything to compare it with, but it has been very hot this evening. We went for a walk before dinner and it was still about 30 degrees. We hope we will be ok out and about tomorrow. The hotel is lovely and quiet. We have a really nice room and have not long back from a good meal. The male owner is from Wales originally. We are planning an early night to make up for the flight and prepare ourselves for the city tour tomorrow. (cj) Well here we are waiting in Terminal 3 and it’s that really dull time when you can’t actually believe that you are on holiday. Why is it that so many people need to travel at the same time? The entire world is here and there are men in sharp suits buying jewellery in Tiffany’s. There is no sign of a recession in T3. We have both been amazed at the fast and painless check in. We were through in a flash and have managed to get long leg room seats for the outbound journey; there are some advantages in being an odd shape. We are saving ourselves for the food on the flight which might prove to be a mistake but we think that they should give us three meals before we land, but as usual it’s a bit of a mystery. Bev has gone off shopping so who knows what she will return with and the number of very posh duty free shops is beginning to concern me. I may write again on the plane as it is very unlikely that I will be sleeping. 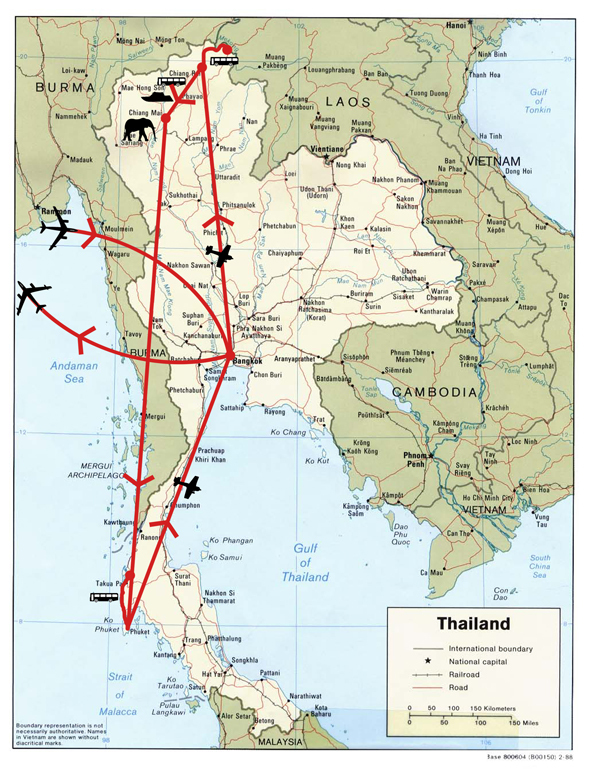 Here’s our route around Thailand and the places we are stopping off at, en-route. We start our journey in Bangkok where we spend three nights looking around this mad, chaotic city. We will be taken out on the Klongs on long-boats where we will fly along the narrow, winding canals that stretch out from the west of the city. Our next adventure takes us north by plane to Chiang Rai and then on by private ‘vehicle’ (whatever that may be) to Chiang Khong, a tiny village in the hills that looks out over the rain forest toward Laos. This place is home to a number of hill tribes and it is here that we will help plant trees and make crafty things. Our next port of call is Chiang Mai, the second largest city in Thailand. Here, we will spend three days sight seeing, riding elephants and bamboo rafting. We leave Chiang Mai and take a two hour flight southwards to Phuket where we are driven up the coast to Khao Lak, a small beach resort to unwind for a few days. We make our final internal flight from Phuket to Bangkok and then leave for the UK, ready to go through a thousand photos. Whilst in Thailand, we are being met by local guides at each of the places that we visit and being shown around. Please make us feel at home by adding comments when you can – it would be great to hear from you all.